This study analyses the prehistory of a northeastern Siberian population, the Sakha (Yakuts), from both a linguistic and a molecular­genetic perspective. The Sakha, who are a Turkic­speaking group of cattle­and horse­breeders, migrated to the Lena river from an area further to the south several hundred years ago. 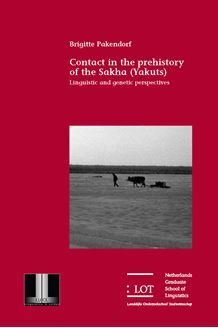 This investigation elucidates the extent to which the Sakha interacted with the indigenous populations of the territory that they migrated to, both from the perspective of language contact and from the perspective of genetic admixture. The results show that the Sakha were in contact with two different groups during their history: with speakers of a Mongolic language and with speakers of Evenki. The contact with the Mongolic­speaking group took place during the period of the Mongol Empire, when the Sakha introduced a large number of Mongolic substance copies into their language. In contrast, the contact with the Evenks led to the introduction of a number of schematic copies, but only a relatively small amount of substance copies from Evenki into Sakha. The nature of the copies from Evenki implies that the Sakha were dominantly bilingual in Evenki; surprisingly, however, there is no genetic evidence for the shift of entire Evenk communities to the Sakha language and identity. One explanation for the discrepancy between the linguistic and the genetic results is that the schematic copies entered the language through frequent social interaction of Evenks and Sakha during the initial period after the migration, when the Sakha were few in number.